Youth | CrossRoads Corporation, Inc. Academic support, enrichment, and mentoring offered for all Grier Heights children ages preschool through grade 12. CrossRoads has partnered with The Learning Collaborative (formerly, Seigle Avenue Preschool) to provide preschool and parenting education for families in Grier Heights. In the past, The Learning Collaborative, a non-profit free preschool for at-risk children, enrolled and provided daily transportation for 16 – 20 children from Grier Heights. After a successful capital campaign, The Learning Collaborative relocated its five star accredited preschool to the Grier Heights neighborhood in Fall of 2016. The Learning Collaborative now serves approximately 80 children ages 2 and up. Closing the achievement gap for at-risk children and dropout prevention are critical components of CrossRoads Corporation’s overall mission to revitalize the Grier Heights neighborhood and improve the quality of life for its residents. To that end, in partnership with Myers Park Presbyterian Church, CrossRoads Corporation provides volunteers and supports three different initiatives at Billingsville Elementary defined as top priorities by the school principal, Alicia Hash: a full-time New Teacher Mentor, a full-time Communities in Schools position and a YWCA after-school and summer program (including transportation). Volunteers are needed year-round as tutors, mentors, lunch buddies, reading buddies, administrator and teacher support, etc. The dropout rate in Grier Heights at 6.8% is greater than 2 times the overall rate for Charlotte-Mecklenburg Schools. The goal of the Bulldogs Matter program at Alexander Graham Middle School is to improve Grier Heights students’ high school readiness and subsequently reduce the dropout rate. It seeks to improve student achievement and engagement through various strategies by providing after school tutoring, mentoring and enrichment 4 days per week during the school year for 65-70 at-risk students. 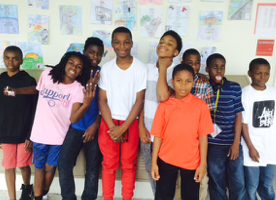 Bulldogs Matter continues during the summer as a Freedom School to serve 70 students for six weeks. Freedom School represents a significant recruiting tool for Bulldogs Matter as it reaches out to rising 6th graders. Bulldogs Matter utilizes volunteers Monday-Thursday from 3:45-5:45. Volunteers are needed as tutors or mentors for one or more days/week. The Joyful Noise Leadership Program meets two evenings each week during the school year to develop faith, mentor, and teach life skills and accountability to the girls of Grier Heights. One night is reserved for younger girls to meet, share a snack , listen to a Bible lesson, participate in small group discussions, do skits, and create craft projects. On the second evening, the program meets with girls ages 13 – 17 who have shown leadership capabilities and an interest in strengthening leadership skills. In addition to participating in a Leadership curriculum, these girls are expected to help plan and implement activities, and lead small groups for the other “younger” night of Joyful Noise and for the neighborhood summer Block Parties. Volunteers attend one program night each week and help facilitate small groups, oversee group activity, and provide consistent relationships with girls over the course of the three month program term. The Kickback is designed to support our middle & high school female youth academically, socially and culturally through one-on-on tutoring, informational workshops and mentoring. The regular program takes place every Wednesday from 6:30-8:30pm at the Grier Heights Community Center with the first hour primarily focusing on academics and the second hour focused on an informational and/or life skills workshop. SBU is an entrepreneurship series promoting education and practical application to female high school students culminating into a final showcase with a chance to win internships. The pilot program began at the start of the 2015-16 school year at Harding University High School in partnership with MeckEd’s Career Pathways program. In its second year, the program was implemented within the Grier Heights Community in partnership with CrossRoads. With a goal to teach young ladies how to create one business that will promote sustainability and unity within the community, SBU provides a solution to social capital and community impact. The regular program takes place every Thursday afternoon during the school year at the Grier Heights Community Center. According to the Centers for Disease Control and Prevention, 10 people die from unintentional drowning every single day, and for black children the chances of drowning are “significantly higher than those for whites and Hispanics at every age from five years through 18.” While the risk of unintentional drowning persists throughout childhood, the age when black kids are most vulnerable is 10. In response to this critical problem, CrossRoads provides swimming lessons for Grier Heights 6th through 12 graders once per week for 6-8 weeks each summer. Volunteers are welcome weekdays during the summer to serve as chaperones and/or to provide bagged dinners for swimmers. CrossRoads partnered with Freedom School Partners Charlotte and Alexander Graham Middle School to provide a free six-week Freedom School for 70 children from Grier Heights, ranging in age from 2nd grade to rising 8th grade. Freedom School focuses on maintaining and developing literacy skills, the character skills that lead to positive academic and life outcomes, and providing children with a community that believes in them. For more information on Freedom School Partners, please visit their website at freedomschoolpartners.org. There are many flexible volunteer opportunities through Freedom School, including supply shopper, snack provider, or afternoon activity leader. Some are weekly whereas others are a one-time opportunity.